Ramps & Rails is an exciting up & down race like you’ve never seen. Choose to be one of 7 popular characters to move along the game board. 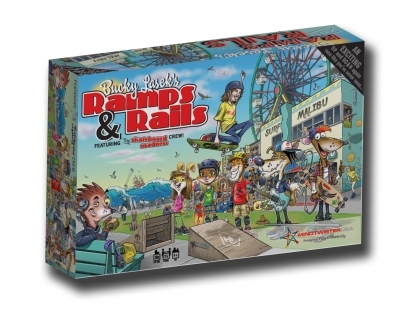 Ramps will launch you forward, but watch out for the rails that will slide you back! A modern twist on Chutes and Ladders! Fun game to play with your skater dudes. Love it! It's like a new and improved Chutes and Ladders. Will help young children with counting.